A series of traditional festive activities will be held at Nanshan Cultural Tourism Zone on the New Year’s Eve to welcome the arrival of the 2012 New Year. 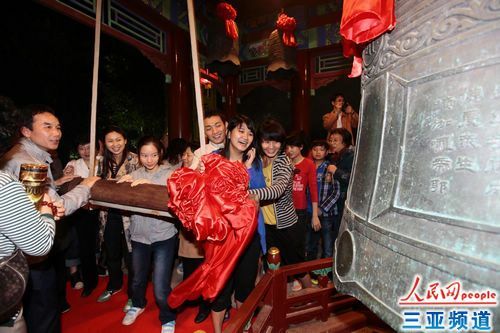 On the evening, the New Year Bell Ringing Ceremony is one of the popular events as domestic and foreign tourists will be offered the opportunity to participate in the auspicious tradition of striking a temple bell 108 times to mark the beginning of the New Year. After New Year’s Bell Striking Ceremony, other similar cultural activities including New Year Gala, Long Noodles Festival, New Year’s wishes on lucky trees and sunrise watching in New Year’s Day will be offered to the public get the New Year off to an auspicious start. Besides, varied performances such as folk cultural songs and prayer activities on the Nanshan tourist sites will continue until Jan.3 to add to the fun during the 3-day short-term travel holiday.